Described by one critic as "a culmination of the last four centuries of theater," The Evildoers runs the gamut of theatrical forms from Jacobean tragedy to drawing-room comedy. Not for the faint of heart, Adjmi's Carol and Jerry and Martin and Judy make Albee's George and Martha look like Sunday School teachers. Be forewarned: the only thing nastier than their tart tongues and their violent actions is their politics. 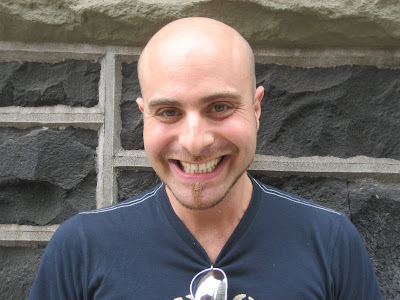 DAVID ADJMI’s plays include Strange Attractors, The Evildoers, Elective Affinities, Marie Antoinette and Caligula. David’s work has been developed and produced at the Sundance Theatre Lab, Manhattan Theatre Club, NYTW, Lincoln Center and Portland Center Stage’s JAW Festival, among others. He is the recipient of numerous awards and fellowships including a McKnight Fellowship, the Marian Seldes-Garson Kanin Award, a Jerome Fellowship, a Helen Merrill Award, an Ovid Grant for New Writing, a Lecomte du Nouy Award, a Cherry Lane Theatre Fellowship, as well as multiple fellowships from The MacDowell Colony and Ucross Foundation. I finally got a post up on my blog about the reading -- check it out. I hope David doesn't freak out on acid when he sees the illustration I chose. Naturally I was just being tongue in cheek -- get it? get it? Tongue in cheek.